This Chicken in foil recipe is a little bit different from other chicken recipes. It is very tasty and delicious. It looks yummy. 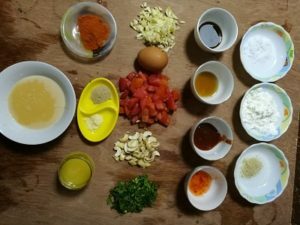 If you want to prepare a new and different recipe for your family and friends you can try this recipe. My friends get together was held at my home last week. I always like to prepare a new and different recipe for my new guest. And if it is about friends so there is a chance to get appreciation from them. We love to get appreciation! 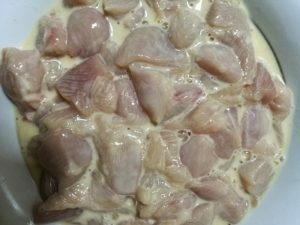 Cut the chicken pieces into 1×1 inch size. Clean and wash the chicken pieces very well. 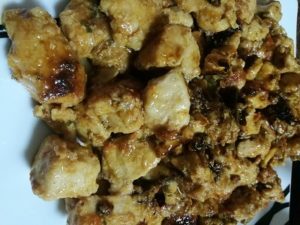 Take boneless chicken for this recipe. Keep it aside. Cut the tomato and deseed. Cut tomato into 1×1 inch size. 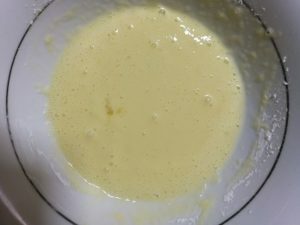 Take a bowl and make a batter with corn flour and egg. Put all chicken pieces into the batter and keep it aside for 10-15 minutes. Turn on the burner and take a deep pan. 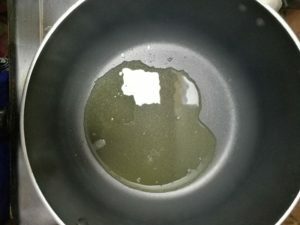 Put clarified butter or ghee into the pan. Put all chicken pieces into the pan. Fry until both sides become golden brown. Fry all chicken pieces like this way. Take away all chicken pieces from the pan. Keep it aside. Take another pan and put clarified butter or ghee into the pan. Add garlic slice to the butter and fry until a good aroma comes out. Add tomato slices to the garlic slice. Mix them very well. 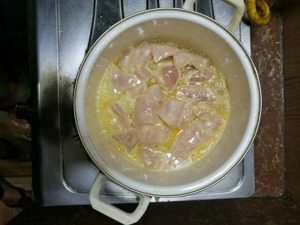 Cook for 1 minute then add chicken pieces to the mixture. After 1 minute add red chili powder, white pepper, and tasting salt to the chicken pieces. Add salt to the chicken and mix them gently. 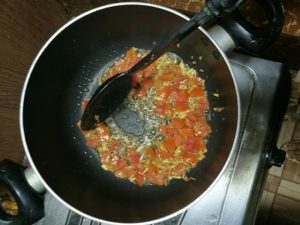 Add all kind of sauces like tomato sauce, chili sauce, fish sauce, barbeque sauce one by one. Stir it and cook it for 3-4 minutes. 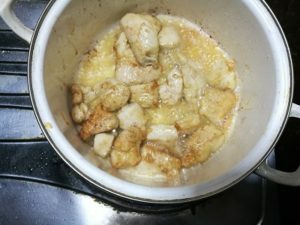 Add condensed milk to the chicken and stir it and cook for another 1-2 minute. If you don’t like condensed milk you can avoid it. You can add 1 tsp sugar and 1 tbsp cream instead of condensed milk. 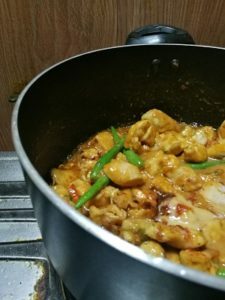 Add cashew nut to the chicken mixture. Mix them. Add cilantro leaves. After mixing cilantro leaves add green chili to the chicken. Turn off the burner after 1-2 minute. Take a foil paper and put all chicken pieces on the foil paper. Fold it very well. 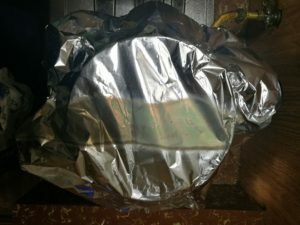 Put the foil paper in a pan and cover with a lid. Cook it for 10-15 minutes with low beam. If you have a slow cooker you can use this for this recipe. Or you can bake it for 10 minutes at 160⁰c. 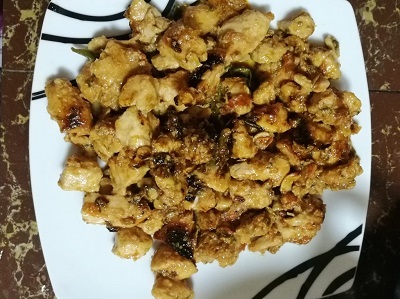 Your yummy and delicious chicken in foil recipe is ready to serve. Its’ smell and looks will make you hungry, believe me. I love to cook and like to share my delicious recipe with my beloved friends. 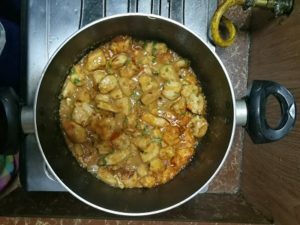 If you like my recipes please share my recipe with your family and friends.